On average, there are eight million Christmas trees bought in the UK each year. But what happens to them come the 6th of January when everyone starts to take them down? Is there a greener way to dispose of your old Christmas trees to help the environment? 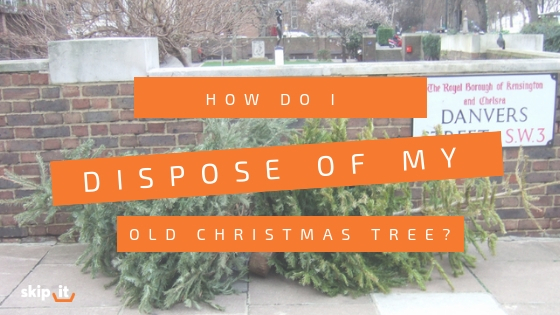 Read on to discover how to dispose of your old Christmas trees. What type of Christmas tree is better for the environment? The official advice from The Carbon Trust is that real Christmas trees have a considerably lower impact on the environment compared to artificial Christmas trees. That’s because the carbon footprint of real trees is lower as they can be disposed of properly through burning or chipping. It will take on average 10 years of continued use until the environmental impact of an artificial Christmas tree will become as low as a real Christmas tree. So, there’s nothing wrong with choosing artificial trees as long as you continue to re-use them for a long time. However, if you wish to switch things up then make sure you get it recycled by booking a Wait & Load residential waste collection service at Skip It because we ensure to recycle 95 per cent of all the waste we collect from our customers. If you choose to recycle your old Christmas tree, you can avoid it ending up in a landfill, which is already under pressure in the UK. Every time a two-metre Christmas tree is recycled it can be turned into compost that can be re-used in gardening and agriculture. Other uses include turning them into wood chippings that can be used in making woodland paths and walkways, as well as coastal defence schemes, according to the BBC. Every time a two-metre Christmas tree is recycled it can lessen your carbon footprint by 80 per cent! You can recycle your old Christmas tree easily when you book any of our residential waste management services, from Skip Hire, Wait & Load, Garden Clearance or Household Clearance. We will be happy to help you recycle your old Christmas tree for you, no problem! You may even want to consider re-planting it in your garden for a Scandinavian feel, and better yet, you can decorate it next year so your garden will look nice and festive too! Just make sure that you purchase a tree with a healthy looking root ball still attached that has been securely wrapped in a burlap sack to prevent it from drying out – so don’t plonk it next to the radiator and remember to water it frequently! Before replanting the tree will need to be acclimatised to re-enter dormancy by keeping it in a cool, sheltered area, such as a garden shed or garage. Dig a hole on a mild day when the ground isn’t frozen, that’s a minimum of twice the size of the root ball but five times the size is best. Remove the burlap sack from the root ball and any other coverings, place the tree in your hole, fill it in and water it deeply. Although these types of trees are slightly more expensive than cut trees, with proper care you can add it to your garden to be enjoyed for many years. Eat it – seriously you can if you fancy it! We bet you didn’t know that the other way you can recycle your old Christmas – you read that correctly, by eating it. This new trend was started by Julia Georgallis, the founder of nomadic bakery The Bread Companion and she wrote about it in her blog. For those who are curious, apparently, the flavours that you can expect from your old Christmas tree are distinct citrus flavours that can be used in homemade ice cream to compliment the vanilla custard base. An easy way to incorporate your old tree is to add some clean and preferable tinsel-free pine needles to the custard during the cooking process. It doesn’t stop there; you can also push the boat out and create a Christmas tree feast by incorporating some pine needles to savoury dishes too! If you’re keen on making homemade pickles, preserves or smoked vegetables, then you’ve been missing out on this crucial and seasonal ingredient! However, safety and taste buds first, Julia Georgallis recommends that you only try cooking with fir and spruce trees as these varieties are edible. Be very careful to avoid eating yew trees at all costs because they are highly poisonous and are not to be eaten. Organic trees are also preferable because they won’t have been sprayed with pesticides or other chemicals to prevent them from catching a disease. So, we hope you’ve got some ideas for next year’s Christmas tree and about how you can do your bit to help the environment and reduce your carbon footprint during the festive season. Remember you can recycle your old Christmas tree with any of Skip It’s residential waste management services. How do I dispose of tyres? How do I dispose of a fridge freezer? How do I dispose of a mattress? How do I dispose of old bathroom fixtures? How do I dispose of a kettle?